The PIC280 is the meat quality boar. 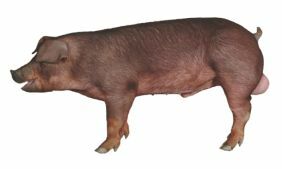 Its superior meat quality and marketability make this Duroc boar ideal for packers. The 280 has a high lean percentage with excellent growth rates and feed efficiency. This powerful combination is the result of PIC's innovative quantitative genetic program coupled with the latest DNA marker technology for meat quality. The PIC280 boar is produced under PIC's most intensive meat quality improvement program to date. This program begins with great-grandparent lines that are selected for long-term improvement in lean, growth rate and feed efficiency. These lines, naturally negative for the Halothane gene, are then genotyped for a range of exclusive PICmarq™ DNA markers for improved pH. These lines are further assessed through routine weekly measurements of carcass lean %, depth of loin, and meat quality from littermates and all other relatives. Terminal 280 boars undergo a thirteen-week performance test prior to being made available for sales. This performance test ensures that boars with the highest production efficiency based on growth rate, feed conversion, backfat and loin depth are identified. Meat quality information gathered from relatives is again incorporated to calculate EBVs for meat color (using Minolta L*) and pH. This ranking gives producers who use the PIC280 a unique competitive advantage to produce high quality pork without compromising robust production performance and profitability.